A "Doctor of the Church" is an individual singled out for the extraordinary advantages the Church has received from his teachings. To receive such a title, a person must have exhibited "eminens doctrina, insignis vitae sanctitas, et Ecclesiae declaratio" (i.e. eminent learning, a high degree of sanctity, and proclamation by the Church) and not be a marytr or Confessor (someone who died or suffered for the Faith, respectively). Early on, this proclamation was given to SS. 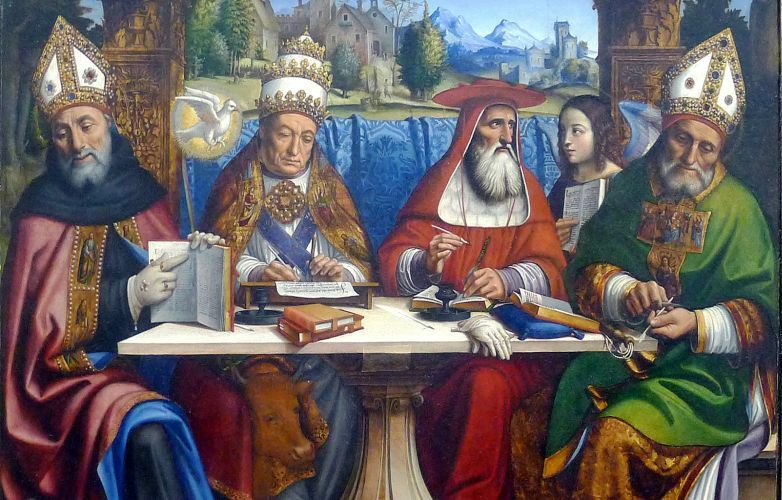 Gregory the Great, Ambrose, Augustine, and Jerome in the West, and to SS. John Chrysostom, Basil, and Gregory Nanzianzus in the East. The Feasts of these Saints were made obligatory in their respective Churches (a collective Feast for all three was later instituted in the East). Though Pope Benedict XIV (1675-1758) wrote that declarations of "Doctor" should be made by the Pope or by a general Council, decrees are, in practice, made by the Pope after the Congregation for the Causes of the Saints (formerly the Congregation of Sacred Rites) examines the writings of the proposed Doctor. Such decrees aren't infallible, and they don't indicate that the Doctors never erred in their works, but they show the great esteem in which the Church holds those who hold the title, and allow for special Masses (In Medio Ecclesiae) to be offered by the Universal Church in their honor. Explanatio symboli (Commentary on the Symbol). Ambrosiaster or the "pseudo-Ambrose," commentary on St. Paul's Epistles attributed to Ambrose. Expositio super primam decretalem "De fide catholica et sancta Trinitate" et super secundam "Damnamus autem"
Hymn: "Concede mihi misericors Deus"
Homily on the Passage "Father, if it be possible . . ."
Homily on the Passage "If your enemy hunger, feed him." Dominus vobiscum (The Book of "The Lord be with You"). De diligendo Dei (On loving God).